If you’ve never grown a rose simply for fear that you’ll kill it in no time, think again! Each year, the National Garden Bureau selects one annual, one perennial, one bulb crop and one edible as their ‘Year of the’ crops. Each is chosen because they are popular, easy-to-grow, widely adaptable, genetically diverse, and versatile.” In 2017, they selected the rose. The rose is the US National Flower and they’ve been around for centuries, with the oldest on record dating back 7,000 years ago in China. Although there are plenty of prima donnas in the rose world — those sweetly scented hybrid tea and grandiflora roses that send off a few gorgeous blooms per stem and need quite a bit of TLC — modern-day rose breeding has resulted in a full range of low maintenance roses, from taller shrub roses to lower-growing groundcover roses. These newer varieties throw off tons of blooms throughout the summer, providing loads of color for months on end and many are considered to be easy to grow. These days, garden centers are filled with easy to grow roses. So, how do you decide which rose to start with? First of all, consider your growing conditions. Are you in an area that suffers from drought? If so, make certain that whatever rose you choose is drought tolerant. Those with two-tiered root systems allow the plant to search deep into the soil for stored water with their lower tier, while fibrous upper-level roots take advantage of more readily available water. The next consideration is how and where the rose will be used. 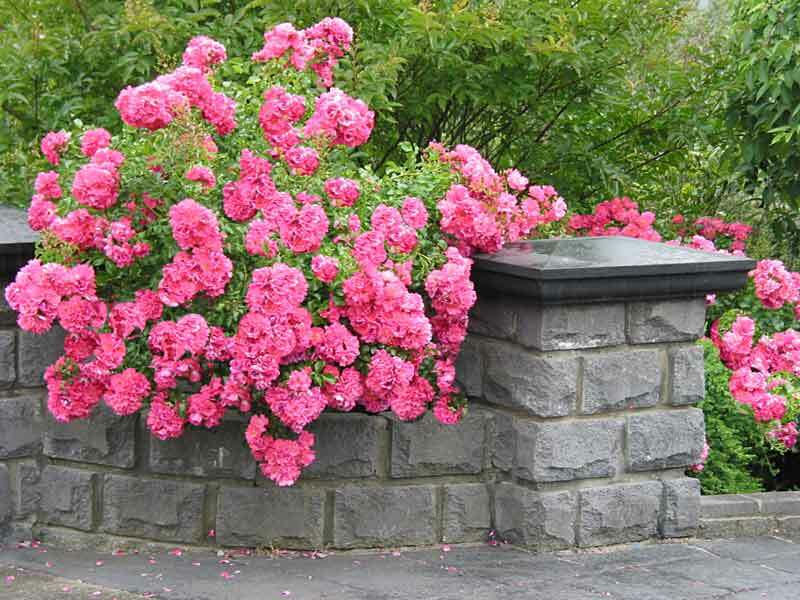 Are you looking for a taller rose to plant along a fence or wall? Shrub roses can grow to 4-6 feet high in a season, depending on your location, making them a good backdrop option. Lower growing roses are ideal in borders and beds, and even do well along driveways, toughing it out through high radiant heat. Smaller roses are ideal for those with limited space and can be planted either in the ground or in decorative containers. Does the thought of rose thorns frighten you? If so, you’ll be delighted to know that there are now “thorn free” roses – well, almost thorn free. If you’re limited on time, easy-care roses are your best bets. Select roses that don’t require any fancy pruning, instead select ones that simply need to be cut back once a year with hedge clippers. Self-cleaning roses – ones whose spent blossoms drop to the ground – are easier to care for as well. While shopping for roses, look for ones that have green leaves, with soil that’s slightly damp but not soggy. Depending on the time of year that you’re buying your rose, you may see buds or full blooms. It’s not unusual to find some yellow leaves on any nursery plant, but avoid plants that have a lot of dead leaves around the base of the plant, or an abundance of yellowing leaves. If the plant is dry enough, try to lift it out of the pot to make certain it has a nice full root structure. Still confused? Your local garden center is a wealth of knowledge. Another way to learn what roses grow best in your climate is to ask friends who may be gardeners, or check with your local garden club or Master Gardeners group. Source and photo: Anthony Tesselaar Plants – One of the early pioneers of the “easy care” rose, who, over 22 years ago, introduced the exceptionally disease tolerant Flower Carpet groundcover roses to American gardeners. Tesselaar.com.